Blue Sky Alpaca is known for its high quality yarns and great colors. Their Blue Sky Alpaca Sport Weight exemplifies those qualities. Made from 100% baby alpaca, it is wonderfully cozy and soft. Alpaca Sport Weight is 15% off through January 2. Elijah is an extremely clever knit from Scottish designer, Ysolda Teague. Elijah is entirely seamless. 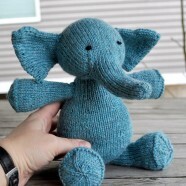 You knit the head, pick up for the body, pick up for the arms, legs and ears. And then you’re done! Just embroider on the eyes and weave in any ends. The version shown above was knit by one of our staff for a holiday gift in Cascade 220. Our latest newsletter is now online. In it you’ll find information on our new class schedule, like our natural dyeing class presented by Earthues, new knitalong and more.